Opening up an existing particle system and playing with its settings in Farming Simulator is the best way to understand how particles work in GIANTS Editor. One good one to play with is the waterfall particle system that ships with Farming Simulator 2015. You can find it with the maps wherever you have Farming Simulator installed on your hard drive (on a Windows computer, it should be something like C:Program FilesFarming Simulator 2015datamapsparticleSystemswaterfallParticleSystem.i3d). If you open that I3D file in GIANTS Editor and click the Play button in the toolbar, you can see the particle system start to work. Enable the Particle System panel by going to Window→Particle System in the GIANTS Editor menu. Doing so gets you a large panel with all sorts of parameters available for adjusting. Depending on how much screen real estate you have, you may need to collapse the various sections within the panel. The values in the Particle System panel don’t make much sense until you actually select a particle system. Find the object named waterfallParticleSystem_emitter1. Select that object and note that the selection in the 3D Viewport looks a bit weird. It has all kinds of crazy squares around the splotchy water bits. Simulation: These are your main controls. They cover the overall nature of your particle system’s behavior. Reset/Reset All: Changes to particle systems are sometimes hard to see in real time. These buttons return the particle system to a home state to have a clean start. Max Particles: As the name implies, Max Particles is the total number of particles from this system that show up at once. 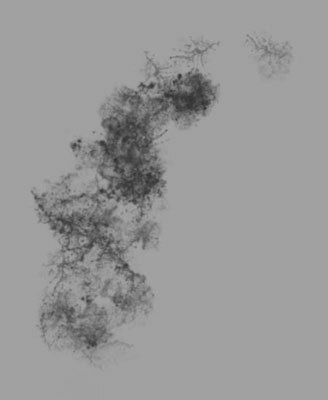 As an example, if your particle system is simulating grain, this should be high. If it’s potatoes, it should be low. Lifespan: This is the amount of time, in milliseconds, that a single particle is on-screen, or alive. After that time goes by, the particle disappears. Max Emit Particles: The total number of particles that this particle system can emit when it’s triggered. For example, you may have a mod with a dispenser that only provides something in fixed increments, such as a potato cannon. If you happen to make a potato cannon for your mod, it would only launch one potato at a time, so Max Emit Particles would be 1. With this parameter set, the particle system runs until it hits this number and then stops until triggered again. Emit Start/Stop Time: You can control when a particle system stops and starts, relative to being triggered. Scale X/Y: Treat these parameters as the starting size for the billboards. Scale X/Y Gain: These values control how much a particle grows each millisecond of its life. If your particle system is for things that don’t change size (like food), these parameters should be set to zero. Delta Angle Min/Max: If you enable the random initialization angle (Rand Init Angle) checkbox, these two parameters define how much a billboard may be rotated from its initial state when it’s born. Gravity: The three text fields next to this label correspond to forces in the X, Y, and Z directions. Because GIANTS Editor (and Farming Simulator) treats the y-axis as up and down, if you want realistic gravity, the y-axis value should be negative. Damping: Damping is a value that represents the amount of resistance (often because of friction) in physics. If your particle system is moving as you like, but just a bit out of control, you can increase the damping value and tone down a bit. 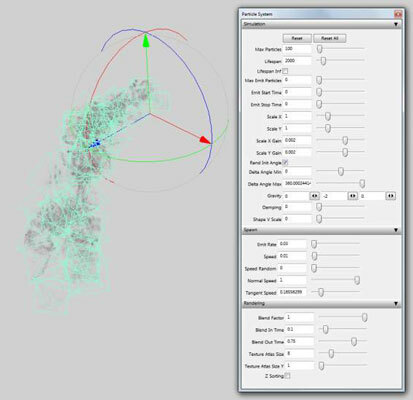 Spawn: Whereas the Simulation section covers the overall particle simulation, the Spawn section has more direct controls over how each particle is born. Emit Rate: With this parameter, you control how frequently new particles are born from the emitter. Speed: You can control the velocity of particles as they come out of the emitter. Low values drip out, high values produce a fire hose. Speed Random: It’s sometimes more natural looking if everything isn’t moving at the same speed. Increasing this value introduces some variation to the speed of new particles. Normal/Tangent Speed: These two parameters dictate the initial direction that a particle goes when spawned. Rendering: Quite possibly the most important section, the Rendering section controls how the player sees particles. Blend Factor: This parameter controls how transparent the billboards appear, regardless of the texture on them. Lower numbers are more transparent, higher numbers are more opaque. Blend In/Out Time: You can vary the transparency of a particle over the course of its life. For instance, smoke dissipates over time. So having smoke particles gradually fading out over their lifespans makes sense.